1998 was a Pro Bowl year for Lawyer Milloy. This jersey is an away jersey with many repairs. 1998 was the last year of Starter making Patriots jerseys as previously stated. There is no front tail tag on this jersey. There is a custom crafted neck tag present but no inside stamp. I would love to add a matching Ty Law jersey but haven't seen a good one out there yet. Here is a rookie home jersey of Lawyer Milloy. A few team repairs are present as well as hit/scuff marks. The 1996 style front tag is present on the jersey. On the interior is a custom crafted team stamp. On the right side flying elvis shoulder logo there is a large scuff that can be seen in the photo below as well as a larg repair within the front 3. The Pats won the East in 1996 and made it to the Super Bowl before losing to the Packers. 1) My blue Byars divisional playoff and AFC Championship jersey, in addition to not having a Custom Crafted stamp, has no tag and no evidence of one ever having been there. It has Starter logos on the sleeves, but no tag inside or out. It may not even be a Starter jersey for all I know, it may just have the Starter logos. 2) I also own Byars' white 1996-97 Super Bowl jersey he wore 2 weeks later. It also has no Custom Crafted Stamp. It does have a tag, but it is what you have documented as a 1995 tag. My 1996 Terry Glenn regular season jersey has a Custom Crafted stamp and a tag that matches what you documented as a 1996 tag. I also own Byars and Glenn 1997 jerseys that both have Custom Crafted stamps and what you documented as 1997 tags. It looks to me like when the Pats made the 1996 playoffs they decided to quickly put together new home and away jerseys made out of leftovers. And I literally mean moved. You can clearly see remants on my Byars Super Bowl jersey where the logos were before they moved them up. The following season the logos remained above the numbers. This home jersey was worn the entire season when the Patriots wore their blue jerseys. The sleeves on this jersey have been custom shortened. 1997 style Starter tag is present on the front of the jersey. Inside there is a team stamp. A few team repairs are present. Some remnant paint transfers are present on teh jersey. In this jersey Meggett threw a Touchdown Pass to Troy Brown and caught a Touchdown against the Steelers. This jersey was last worn against the Dolphins in a playoff win. This is great info, but as I've learned in the last few years there are no absolutes with this era of Patriots jerseys. Specifically regarding the Custom Crafted stamp, not all Patriots jerseys got them. When the Patriots Pro Shop started selling jerseys on their website a couple of years ago I ordered what was listed as a 1997 Keith Byars home jersey. I already had a home 1996 Terry Glenn and a 1997 road Byars, each of which had Custom Crafted stamps, as did every other Pats jersey from that era that I had seen. When the jersey arrived it did not have the CC stamp. My first thought was it was a fake, but the jersey had a TON of marks/burns/damage/repairs and it came straight from the Patriots. I went to the internet to see if I could photo match it. It took all of 2 seconds to identify it as the jersey Byars wore in the 1996-97 AFC divisional playoff and Championship games against Jacksonville and Pittsburgh. When I was in Boston last year I met with Jim Scollins from the Pro Shop and told him this. He told me that during that time frame the Pats actually used three different shops to do the names/numbers/logos, not just Custom Crafted. I completely agree. Don Brocher (long time equipment manager) was a great resource to us before he passed away. He explained that it wasn't uncommon for them to use different shops for jerseys during the course of a season. The years stamped or tagged on a jersey don't always mean exactly what they read either. The equipment guys didn't care if the jersey was tagged a previous year as long as it was the cut, size style and manufacturer they needed. Players have even change their cut, size, sleeve, etc mid season for weather,comfort or whatever. Back up jerseys were sometimes use for a single game if they were behind on repairs. All that and more can lead to some elements of a jersey not lining up they way you might expect them to. Michael, we will try and get a Ty Law jersey available this season - Thanks for starting this thread, awesome stuff! This helmet was worn by Ty Law from the preseason all the way through the playoffs. The Flying Elvis logos were not changed on this helmet throughout the season as the same ones can be seen from preseason until the end of the season. The rear decal that covers up the "Riddell" decal has been removed. In the playoffs the Patriots switched from the blue "PATRIOTS" rear decal to a "Riddell" decal with the Patriots logo to the left of it and a playoff logo to the right of it (this can be seen in the last photo). The chinstrap is screwed to the helmet on the upper attachments and shows season long wear. During most of the season Law has the lower right chin strap attached with the lower left strap hanging loose. The 1997 Patriots season was the first under Pete Carroll and ended with a playoff loss in Pittsburgh. A special thanks to Larry P. who was kind enough to allow me to add this to my collection. Larry was a real pleasure to deal with and is a great asset to our community. A special thanks to Larry Pelliccioni who was kind enough to allow me to add this to my collection. Larry was a real pleasure to deal with and is a great asset to our community. I typically don't write out last names on my posts to help maintain some google search level of privacy, but since Larry has no problem with it, I wanted to include it in there. A big thank you Larry Pelliccioni! Larry is the best! Truly a pleasure to conduct a transaction with! He started off his career with Parcells famously referring to him as a "she." Terry Glenn was one of the more talented Patriots Receivers that I've watched play and had a great rookie year in 1996. This is a 1997 Glenn jersey straight from the Patriots. 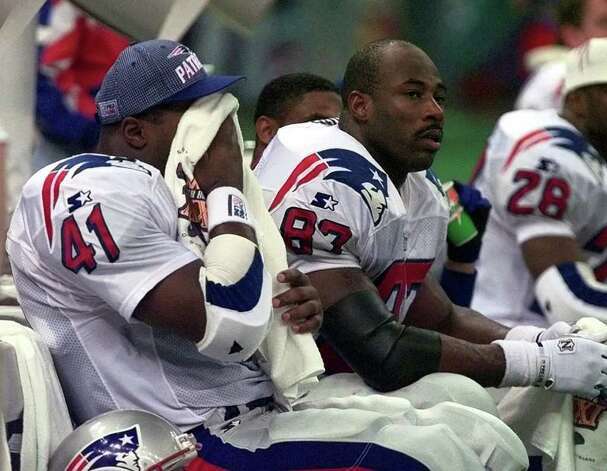 As was typical of his time in New England, Glenn missed several games in 1997 due to injury. This home jersey shows definite laundering, no team repairs are present. Cuffed sleeves are present. In 1997 Glenn wore the home style jersey for games against the Chargers, Bears, Bills, Packers and last in the playoffs against the Dolphins.